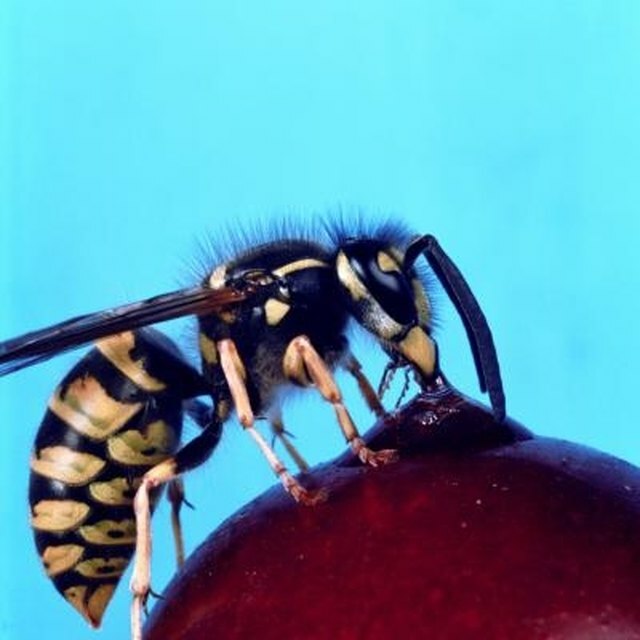 Insect-eating hornets actually can be beneficial around the yard, but when they begin to build nests in bushes near home or outdoor activities, removing the hornets is necessary. This can be a difficult task, however, and one that is made easier by thinning out the colony before attempting to remove the nest itself. There are several different methods that can be used, and you probably will have to use a combination of them all. Hornets can be unwanted pests when they are close to the home. Thin the number of hornets in the colony from a distance. When nests are located in bushes, they can be difficult to access without being disturbed. Place lure traps in the area around the nest. Fill two or three 1-gallon or similar-size buckets or soda bottles half full with water. Tie string around a piece of meat small enough to fit inside the neck of the bottle -- beef, pork or chicken will work -- and secure the string to the edge of the container. This can be done by tying the other end of the string around the neck or taping it to the side of the bucket with duct tape. When the hornets have eaten their fill, they will be too ungainly to fly and should fall into the water and drown. Change the bait every other day for several days. Kill larger numbers of hornets with commercial sprays. This can be done first from a distance, spraying the insecticide on the outside of the nest. After activity outside the nest has slowed, get close enough to see where the hole is; there generally is one in the bottom of the nest. Wearing protective clothing, eye wear and head wear, spray the insecticide directly into the hole. Repeat as often as necessary until there is no visible activity outside of the nest. Follow the label instructions for the proper use of insecticides. Place the nest inside a heavy-duty garbage bag and tie it shut. If the nest is in the bushes, this can be a tricky method, even with protective gear. If no hornets are visible, the nest can be broken off in pieces. A safer alternative may be to remove the entire branch and trash it. Deal with the hornets at dusk or in the early night hours when they are less active. Hornet stings can cause a severe allergic reaction in some. Have antihistamines on hand just in case. North Carolina University Extension: Hornets and Yellowjackets; Bambara, et al.